The North American home video distributor Discotek announced through its Facebook page that it will be releasing the entire Ruby Spears Mega Man cartoon on DVD. A single collection of all 27 episodes are due to hit retail in early 2014. The series hasn't seen a proper DVD release since 2002. ADV Films attempted a two volume reprint back in 2008/2009. However, only the first volume managed to release before the company was shuttered. Fortunately, Discotek is here to pick up the pieces. So yeah; great news if you're a fan of this quirky interpretation. I'll be sure to keep an eye out for preorders. Stay tuned! This show is more twisted than a car wreck! Hey, nice. :) Hopefully this time around there'll be some actual special features (concept art would be good). Oh good, but i have already the old DVD, but it was a funny cartoon, now really an anime with a good story, but it's cool anyways (and yeah, some robotmasters are """"special""" in this anime), it can be cool for some childrens I think. The story is not complex, it's a simple anime but it's a good thing to see that. The whole show was released on two DVD box sets one time, which is where I got them all. But nice to see it re-released in its entirety! Awesome! The second volume is actually pretty expensive so it'll be nice to have a cheaper alternative to own the whole show! Plus it's always nice to see this version of Mega Man get some attention! Are you referring to the '09 volume? Gosh; I even got a cancellation notice from Amazon way back. You sure? I'm with Protodude on this one. 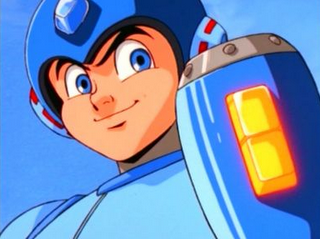 Anyways, we need to help all the company or things who want help us to make megaman known by all the people! Anyways, good thing! Lets rock! Umm....... I already own the 2 volume DVD's that were released earlier. Is there any reason to get these? Or are they basically the same episodes? Or is there new content that was not present in the old DVD sets? The series in its entirety has been out of print for eleven years. So if you don't have the old sets, this is a nice all-in-one option. This show was goofy, but it was the right kind of goofy that made it fun to watch. The action generally isn't horrid, some of the master weapons are interpreted very interestingly, (Woodman uses an actual shield shaped like a leaf, that's pretty clever.) And the voice work is so hammy and fun you can't help but love to quote it. "Now why would anyone bar the outside of the bathroom door? ... Oh no!" "It can pull ze MOOOOOOOON out of it's orbit!" "We heard the silent alarm, Dr. Wily. What gives?" I might have to get this! F- Da Haters is all I have to say. Still, this set won't be worth buying if it lacks extras.